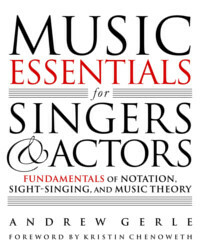 “Singers who are literate musicians have a great advantage in the competitive musical theater and opera marketplace,” asserts award-winning composer-lyricist Gerle, and his excellent book provides just that advantage. Assuming nothing, Gerle patiently and meticulously details the basics of beat, intervals, and key signatures, expanding his discussion to connect theory to performance. For instance, he explains the effect of a rest or building from eighths to 16ths and links score to character analysis, as when Anne’s beat-late entrance in her A Little Night Music solo reveals mixed feelings despite the waltzy lightness of the time signature. Significantly, Gerle identifies patterns and chord progressions that will help singers learn to sight sing their way through an audition or master a role quickly, and one chapter clarifies working with an accompanist. (Given the nature of vocal performance, Gerle’s elucidations work through the piano keyboard, which make them valuable even for those who are musically literate but on another instrument.) Boldfaced terms; exercises (with answers); audio examples, also with answers (found online with the furnished code); and numerous familiar musical examples make for a thoroughgoing offering. None of the numerous biographies of Alexander the Great (d. 323 BCE) have focused on the extreme religiosity of the Macedonian warlord, argues Naiden (history, Univ. of North Carolina at Chapel Hill; Ancient Supplication), whose every act, from building to besieging, marrying to murdering, was infused with religion. This otherwise fine and accessible biography is marred by the author’s unconvincingly extended argument: whenever Alexander fully incorporated local religion, he triumphed, but when he eschewed regional gods, he stumbled. Though, indeed, Alexander never adopted Persian or Indian deities, he still ably expanded his rule in those regions and only “failed” owing to succumbing to either alcohol or illness, after he returned to reign in Babylon. Further, it is unclear that Alexander was more religiously apt than his contemporaries, which the author concedes in the dense endnotes. Alexander flourished in a time when gods were everywhere and in everything and polytheism had a particularly flexible nature, easily and broadly mutable and adoptable. Music journalist Obrecht (Talking Guitar) takes a day-by-day look at a pivotal period when Jimi Hendrix (1942–70) spent almost nine months in London. He was discovered in New York’s Greenwich Village by Chas Chandler, of the Animals, who became his manager and took him to England, where Hendrix jammed with Cream and impressed Eric Clapton. Musicians Noel Redding and Mitch Mitchell were recruited to form the Jimi Hendrix Experience, and the group began touring and recording. Charles Cross devoted two chapters on this period in his biography Room Full of Mirrors, and Hendrix’s episodes in London were treated more broadly in William Saunders’s Jimi Hendrix: London. Obrecht’s level of detail distinguishes his account. He quotes liberally from interviews with Hendrix and concert reviews and describes the group’s recording sessions. Hendrix’s private side comes through strongly, but, most of all, Obrecht delves into the artist’s musical skills, influences, and often overtly sexual flair for showmanship. Cameo appearances by the Rolling Stones, Engelbert Humperdinck, and others add another layer of interest. The book concludes with Hendrix’s return to the United States and the Monterey International Pop Festival in June 1967. The transition to a post-Soviet world was difficult for former republics, including the present-day country of Georgia. In 1993, CIA operative Fred Woodruff (1947–93) was a casualty of this upheaval. In his debut book, lawyer Pullara, motivated by the pursuit of justice, along with a personal relationship with the decedent, embarked on a journey involving an extensive paper trail and political cover-ups. The author describes Georgia in the 1990s as a corrupt state that was also being courted by the United States as a pro-Western ally. Key questions surrounding Woodruff’s murder are considered, including Georgia’s sudden determination that the crime was not political, as well as a possible link between the killing and the arrest of CIA officer–turned–KGB mole Aldrich Ames on charges of espionage. Interwoven are tales of diplomatic quandaries, complex relationships, drug smuggling, dead ends, and a triple agent, making for a large cast of characters and sometimes meandering text. Still, Pullara deftly transcends one man’s tragic death to provide a riveting outsider’s perspective on espionage and CIA intrigue. Two events in 1972 fixed the late British novelist Berger (1926–2017) in the public eye. Upon receiving the Man Booker Prize for his novel G., the author attacked its sponsors as imperialist oppressors, donating half of the prize money to the Black Panthers. That same year, Ways of Seeing, adapted from his TV series deconstructing the art world, appeared on bookstands. Mixing biography, intellectual history, and art criticism, debut author Sperling (cinema studies, Oberlin Coll.) traces Berger’s long, productive life; in addition to his novels and stories, Berger painted, wrote poetry, curated a major gallery show, and coauthored several phototexts and films. The final four decades of his life were spent in France, where he wrote about peasant life. Always sympathetic to the dispossessed, Berger never abandoned his early Marxism but also didn’t give in wholly to its ideology—his contradictions make him appealing still. From her childhood in rural Tennessee to her hard-won reinvention as a successful solo performer, Grammy Award winner Turner has proven that she has not only immense talent but also a great reservoir of individual resilience. This frank memoir, cowritten by Davis (Strapless; Party of the Century) and journalist Wichmann, chronicles the singer’s rise to a dream career as part of the Ike and Tina Turner Revue, which turned into a nightmare of years-long abuse by her husband. Turner’s narrative is at its most riveting when she describes this increasingly disturbing period and her courageous escape. Leaving it all behind—personally, artistically, and financially—she eventually built a triumphant solo career with hit songs (“What’s Love Got To Do with It”) and albums. Her anecdotes about concerts and career experiences, travels, appearances with stars such as Mick Jagger and Beyoncé, and work on films and other projects are informative and entertaining. She married German music producer Erwin Bach in 2013, and her gratitude for his loving support, especially when she faced serious health and family issues, shines throughout, as do her optimism, perseverance, and faith. Full-color and black-and-white photos beautifully enhance the text. Vronsky (Serial Killers; Female Serial Killers) pens the ideal book for anyone looking for a crash course in serial killers. Indeed, those thinking that they started with Jack the Ripper are mistaken. The author begins by recounting his own intriguing encounter with a serial killer. From there, Vronsky ponders the nature of serial killers, concluding that people are not raised to become serial killers but rather raised out of being one. The narrative depicts a violent yet thorough path of killings from the Stone Age through the 1990s. It’s difficult to read of the numbers of victims, especially women and children, needlessly murdered discomforting to realize that no one truly knows what separates a serial killer from the average citizen—the term serial killer didn’t originate until the late 20th century.